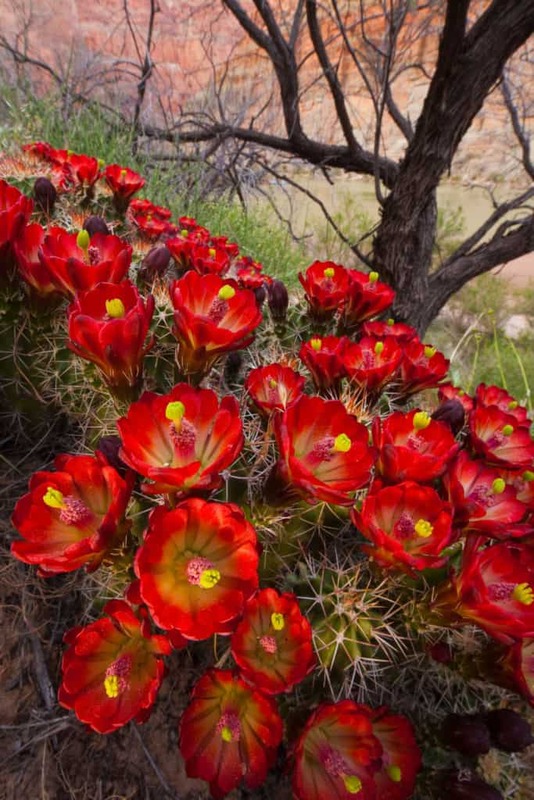 Are you ready to identify three easy Grand Canyon spring blooms? 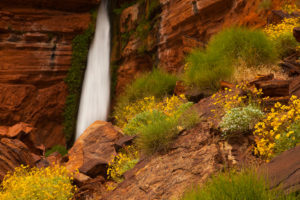 The spring lends way to some of the most colorful displays of blooming flowers in the Grand Canyon. The Grand Canyon is quite diverse, despite its “desert” reputation. The environment consists of several different plant communities from riparian to desert scrub. We couldn’t even begin to identify the 1500 different species of vascular plants known to the Grand Canyon. 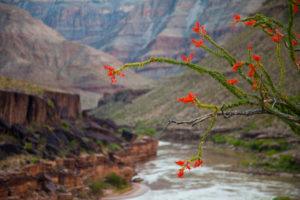 However, here are three very common and beautiful Grand Canyon spring blooms you may see on an April raft adventure. Deer Creek Falls and Brittlebush, Photo by Ralph Hopkins. The brittlebush is prevalent throughout the Grand Canyon and the Southwest Sonoran Desert. It is a round-shaped shrub and ranges in size from two to five feet in height. The stems are very brittle and break under even the slightest pressure (thereby, claiming the name brittlebush). Believe it or not, it is a member of the sunflower family. Look closely and you will find a yellow, daisy-shaped flower. The leaves are light in color and a little fuzzy. The little hairs on the leaves help protect the plant from extreme heat and also from frost. The light color helps reflect more sunlight keeping the plant cooler. If you break a stem, take a sniff and you will smell a fragrant resin that was once used as incense by the people of the New World Spanish Missions in Baja, California. It thrives on rocky, well-drained slopes, hence, why we see it blanketing the steep slopes and washes. If Arizona has a wet winter, the spectacle of blooming brittlebush is indescribable in March through April. However, the bush remains long after the flowers die off. You can find the bush year round. 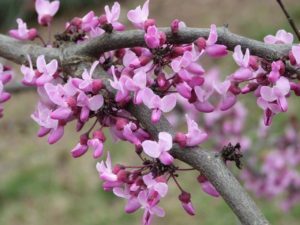 You won’t likely see the redbud tree along the river but you find this medium-sized tree (up to 16’ in height) in the washes and side canyons. 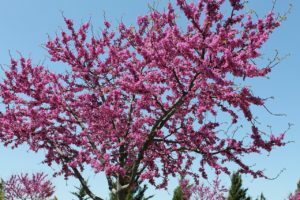 In the spring it blooms purplish flowers bursting from the branches. If you look closely at the branch, you see a pea-like pod dangling from the branch near the flower. During the flowering season, the pods are light green in color. But after the blooms die off, the pods turn brown. The redbud is also very beautiful in the fall. The green leaves of this deciduous tree turn a gorgeous yellow before they drop to the canyon floor. The tree has been important to several Native American cultures. The pods can be roasted and the seeds can be eaten. The twigs were used in basketry. The branches have been used to make bows. The leaves have been used as incense in Navajo ceremonies. The bark has been used to treat chills and fever. Ocotillo in Grand Canyon National Park, Arizona. Photo by Ralph Hopkins. One distinct, showy and easy to identify Grand Canyon spring bloom is the flower of the ocotillo plant (pronounced o-ko-tee-yo). The ocotillo grows leaves and blossoms a beautiful bright red flower cluster at the tip of the branch March through May. The plant has long, straight, spiny, woody branches growing from the base and creates a funnel-shaped plant. The plant can grow an upwards of 25’ tall. You spot the ocotillo in the lower canyon starting about river mile 153. 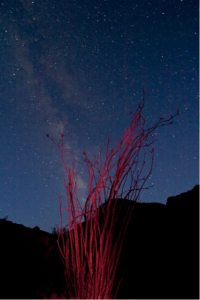 The ocotillo thrives in well-drained, sandy, gravely soil. In fact, many ocotillo grow along Diamond Creek Road. If you look, you will see them out the bus window on your ride up the wash at the end of your expedition. Ocotillo in the moonlight. Photo by Lynn Myers. An interesting fact about the ocotillo is that it is commonly mistaken as a cactus. It is actually not a true cactus. However, much like a cactus, it can live off of only 8” of rain per year. Interestingly, it has many medicinal properties. The blooms are important to bees and hummingbirds and the pollinators contribute to desert diversity. The flower is made into tea and can even be an edible flower in a salad. They also make a fence line in natural landscaping projects. On top of these facts, the ocotillo is an impressive plant to look at! Brittlebush, Redbud and Octotillo – Oh My! Rafting in the Grand Canyon with Arizona Raft Adventures in April comes with many benefits. Most notably, the spectacular display of the Grand Canyon spring blooms! There are many other blooming flowers in the spring including several cactus too! The desert is colorful. The desert is rich in diversity. Visit the inner Grand Canyon in April and see for yourself! Like what you see on the AzRA blog? Sign up to receive an email notification when a new article posts (only for article notifications).